As you know, Halloween was this week. I wasn't going to do a costume for my little one since she is only five months. 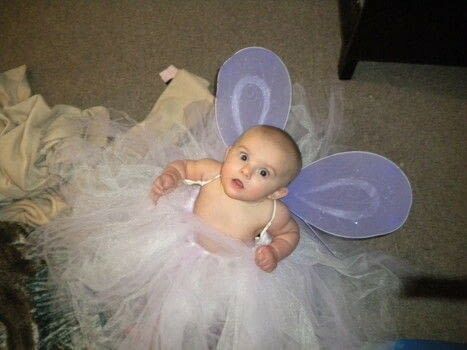 Then I saw fairy wings at the dollar store, and figured, eh, why not do something little. I had tulle given to me by my baby's godmother from my baby shower. So, what can I do with it? Make a tutu for my little baby girl! You will first want to measure out the waistband of your little one. Of course elastic will stretch, but you will want to get a rough idea of how much elastic you will need. Add two inches to the amount you measure. Overlap the extra inches and sew a zig zag stitch. Ta da, you have a waistband! Decide how long you want the tutu to be. If you'd like the tutu to be 20 inches long, fold over the fabric so the doubled up fabric is 20 inches. (It's better if you measure long..you can always cut the tulle once you've completed the tutu if you need to go shorter) Cut along the raw edge. 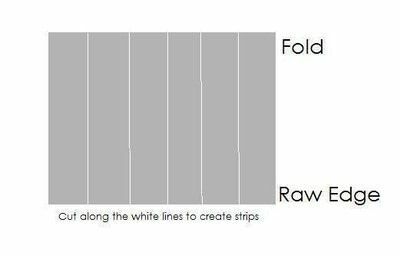 To create strips, now cut length wise. I made my strips approximately six inches wide; however, I did not measure each strip. I just eyeballed the width. Grab a bucket. Put the elastic waistband around the bucket. 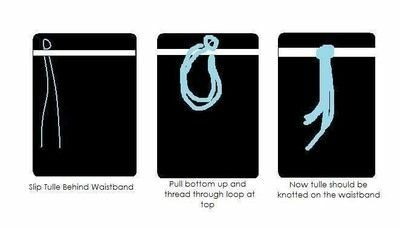 Slip tulle behind the waistband to create a loop and pull remaining tulle through. You have now knotted the tulle on to the waistband. Continue all the way around the bucket. You now have a fun tutu for dress up, for pictures or for costumes! You can experiment with adding embellishments like flowers or even bows. I think I might try to weave some satin ribbon around the top. so cute your baby..........choooooooooo sweet.